Fresh garlic pieces surround the mild tangy taste of lemon and the boldness of black pepper within this smooth creamy sauce. 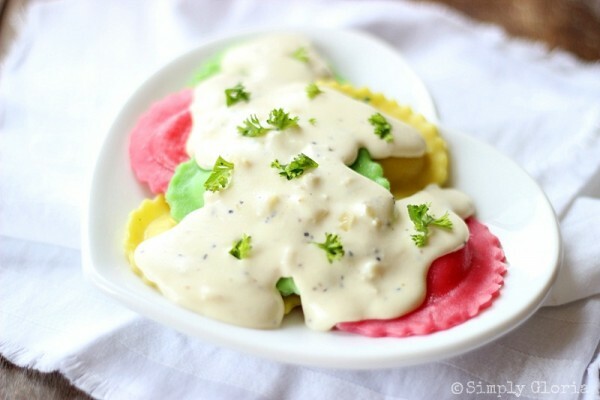 Lemon Peppered Garlic Cream Sauce is THE cream sauce to pour over your favorite pasta! Making sauces in my kitchen is pretty much a daily ritual. Like, the spaghetti sauce that simmers all day long… almost weekly. Or, the quick tartar sauce for fast dipping action. I could seriously go on and one about so many sauces… only because, I’m a saucy kind of girl. But, there’s the fast-and-make-it-happen sauce like this Lemon Peppered Garlic Cream Sauce for pasta! Once you make this sauce, you’ll see how simple and easy it is to make a cream sauce from scratch with natural ingredients. You’ll be starting the sauce right as you start the water for your pasta. Then, this creamy, tangy, lemony, garlic infused cream sauce is finished right as your pasta is done and drained. Add some grilled chicken on top, and you have an amazing meal! This is a fast cream sauce that needs no jar to open, and no all day simmering. And, the funnest part is that you get to pour it all over your favorite pasta! I think I’m a little obsessed with pasta. Not only by inhaling eating it, but there are so many shapes and sizes… and colors! In case you’re wondering about these fun colored ravioli, I found these Organic Italian Four Cheese Easter Egg Shape Ravioli at Costco. They are created by Nuovo Pasta. 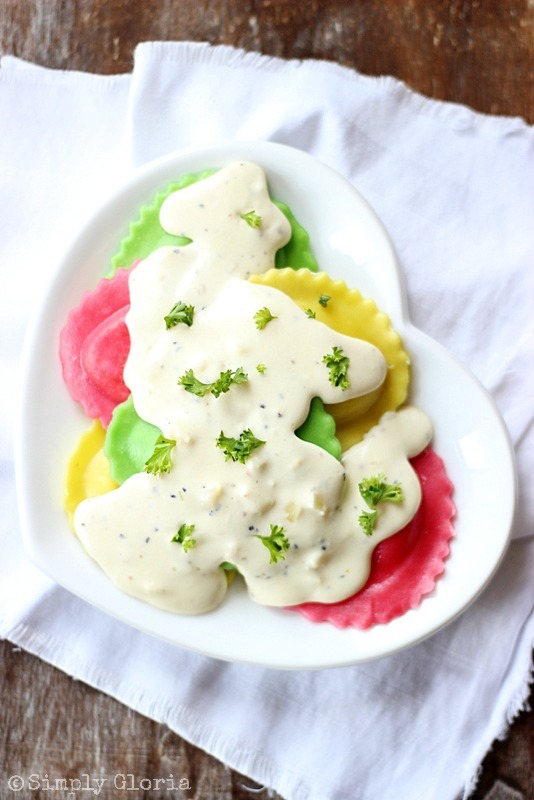 The taste of these fun filled pasta shapes with this Lemon Peppered Garlic Cream Sauce is just phenomenal! Literally melts in your mouth with so much flavor! In a large skillet on medium heat, melt butter and saute the garlic for 2 minutes. Add cream cheese and 1 cup of heavy whipping cream and seasonings. Whisk together until cream cheese has melted and all combined. It will be thick. Add the rest of the of the heavy whipping cream and half & half. Whisk and simmer until it comes to a creamy consistency. Usually takes a few minutes. The longer you let the sauce simmer, the thicker it becomes. If it gets too thick, add a tablespoon of half & half (or milk) at a time. Sprinkle in the lemon pepper seasoning, garlic and onion powder. And salt, to taste. *I am not being compensated by giving you information about this pasta product. I just wanted to share the love with you! What a gorgeous cream sauce, Gloria! I’m pretty sure I would pour this sauce over just about everything. 😉 LOVE the combo of garlic and lemon. And all of your photos are absolutely beautiful—they capture the amazing creaminess of this sauce! pinned. You’re so sweet… thanks for the PIN action, my friend! omg, yum!! Can’t beat pasta and a cream sauce! Hope all is good with you haven’t talked in a while! I am all about the cream sauce on pasta! 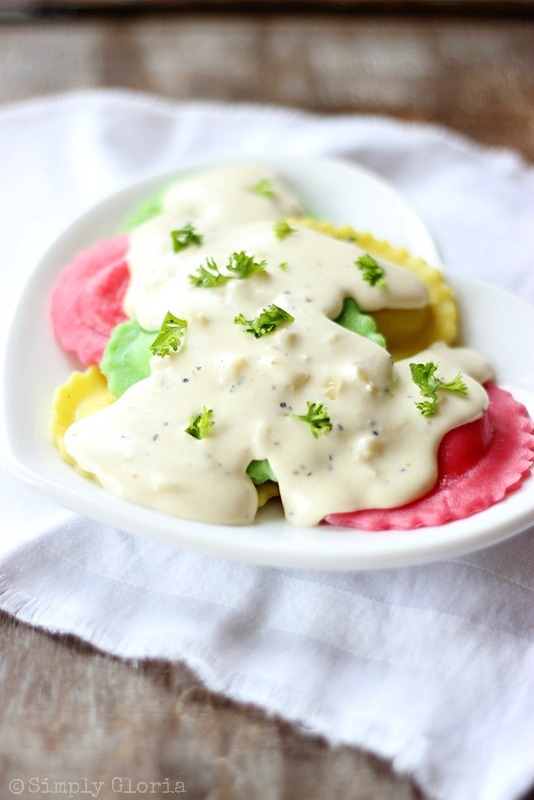 And those ravioli are fabulous!! I know a couple of people (hubs being number one) who’d worship me for making creamy pasta more often. Looks great, Gloria! Oh my, look at that creamy lemon pepper sauce! And served over the colored pasta is so fun. Great dish, Gloria! Looks like heaven on a plate! 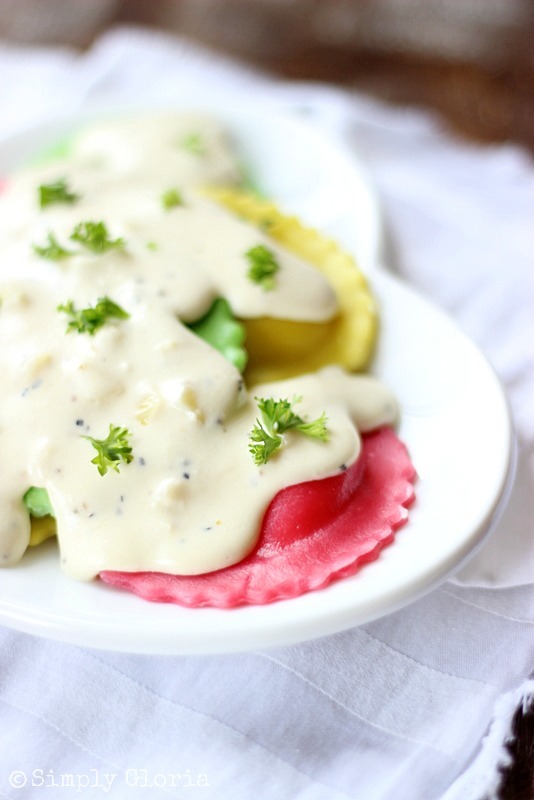 I love pasta too, especially when it’s under a blanket of creamy cheesy sauce! So comforting! Well put, Allie… I love it! What a deliciously creative sauce!! Such a great alternative the the normal stuff we through on pasta. Would be great on chicken as well! This is such a perfect pasta sauce!! Though I love marinara sauce, I can get tired of it! I love the colored pasta you have to go with it!! 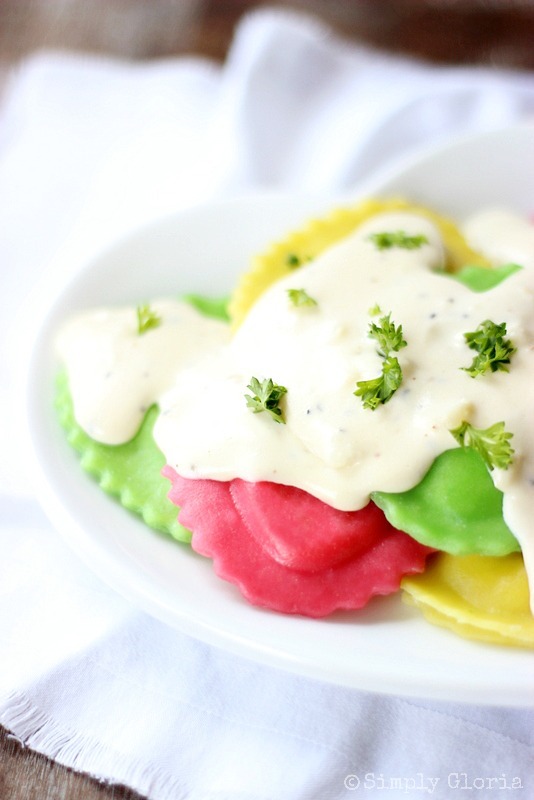 That is the most fun ravioli I’ve ever seen. I would almost feel bad covering it up with that sauce … but then I think about the sauce and am like, nope, give me creamy garlic sauce by the cupful, thank you very much! Mary Frances, you seriously always make me smile and laugh out loud! Big hugs to you!! This sauce looks so yummy–cream cheese AND half and half and I love that this has the lemon pepper in it. …pinned to try. I am with you. I am a sauce girl too. A good sauce (or dip) makes everything better:) Have a great weekend! Rachel and Kathy, you hit it right on… sauce and dip makes everything so much better! Have a fabulous weekend ladies! Hope you’re having an awesome Monday Gloria! Garlic is one of my weakness. Thank you, Melanie! How fun is that pasta?? And the sauce, good lord, does that sound good!! I want!! 🙂 Pinned! Don’t you just love this pretty pasta?! This is exactly that kind of sauce you’d want to drown pasta in! Thanks so much, Kelly!